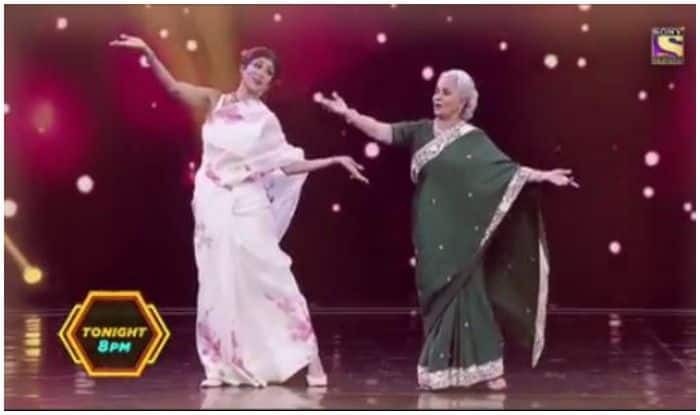 Shilpa Shetty Kundra-Waheeda Rehman’s ‘Surreal’ Video Dancing to ‘Aaj Phir Jeene Ki Tamanna Hai’ Goes Viral! Later, Shilpa uploaded a video were they can be seen setting the floor on fire with their groovy steps and fans were left asking for more. While Shilpa donned a sheer white saree with floral prints, Waheeda Rehman was dressed in an elegant green one. Shilpa captioned the beautiful video as, “Surreal moments can’t be planned… like this was for me. Must watch tonight’s episode of #superdancer to believe dreams can come true. Ahem! Went a bit cray after that but all is well now…To be able to recreate this moment with a legend like #Waheeda ji and be part of it was sooo incredibly special. Tonight only on @sonytvofficial at 8pm. #blessed #gratitude #special #mustwatch #superdancer #tvshow #legend #surreal #unforgettable #moment #nostalgia” (sic). Shilpa is currently a co-judge on reality dance show Super Dancer. Her film journey hasn’t been quite impressive and she herself accepts that. While having a conversation about her career at the 20th FICCI Frame, she talked about how the audience has accepted her better today than in the past when she was doing films. Shilpa also expressed how it hurt her when she wasn’t acknowledged for her performance in acclaimed films like Phir Milenge (2004) and Dhadkan (2000). Apart from that, the actress has launched her own fitness Yoga DVD. The diva is the epitome of fitness. Known for being uber health conscious, Shilpa has her own collection of yoga DVDs and nutrition books. Often, she makes it a point to talk about yoga asanas and their benefits, healthy eating, recipes and general gyaan on healthy living.